Raidens. Image from the Internet, as the Raiden is currently discontinued. These two miniatures had to have their weapons swapped for sub-machine guns, and also I had to add them a kusazuri (armored skirt) with an hexagon motive ‘looking like an ODD’ (Optic Disruptor Device) as there are in other armies. He couldn’t give me more information at that time, being that those troopers were still a secret under development, but once the Uprising book has been reveiled, I know now he ment the new Ryukens. MS Paint and me, best of friends. It’s alive! And it speaks Japanese! Also dubbed ‘The lil combi-rifle’ from my friends. Don’t mind the bases, those were the first ones I had in hand. My warcor already had his own bases to use with them. 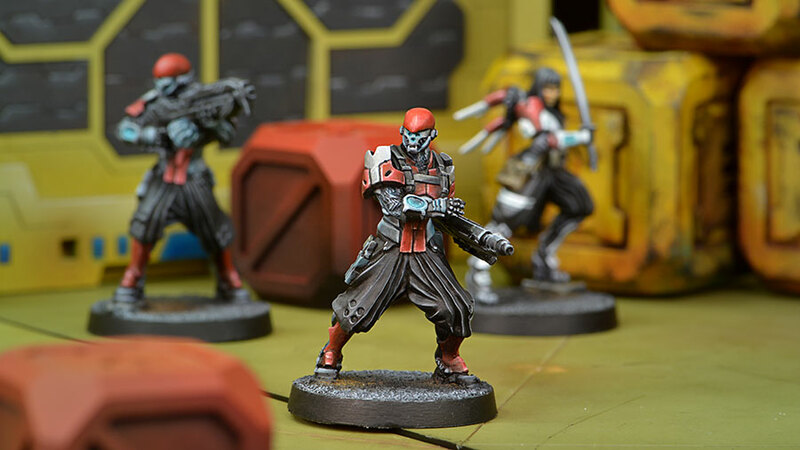 My warcor enjoyed a lot this conversion… Although the official Ryuken miniature has already been released, so I sincerely doubt they will ever be painted or fielded, but I’m reliefed to know that my pseudo-Ryuken troopers were at least fielded during testing matches.